"So, back to school haan!, are you happy?" I asked my son's little classmate as we met at a supermarket one day, "Yes aunty I'm very happy", "You know I loved school too. ", I told her, "the smell of fresh new books, the fresh weather, new teachers, new classmates!, what do you like best? ", "I like chocolate! ", "So sweet I said, but what about school? :, "Yes aunty, when Ill go to school na, Mummy will give me kisses and Daddy will get my favourite chocolate and then they will ask me to take a bite and then say have a nice day...", "Oh I see", I said, "Hmm I agree with you my little friend sweet food on way to a new beginning! I wish you all the best, bye!" and we parted. Simple, innocent and uncomplicated, children make the world a happy place each day with their quirks, attention to detail and insights, but more importantly with their ability to say it as it is. What a sweet thought (no pun intended) to love school reopening because, well chocolate! Gets me to think, dont we all, adults, teens, tweens brighten up at the thought of having a little chocolate? Its not known to be the food for the Gods for nothing and a little chocolate never hurt anyone! Now, I'm someone who derives inspiration from the most mundane of things, like things people were talking about, the colours of flowers, rain clouds the list goes on, so coming back home I thought of making my own personalised chocolate bark, one that perhaps isn't as easy to find and customised to my own taste. 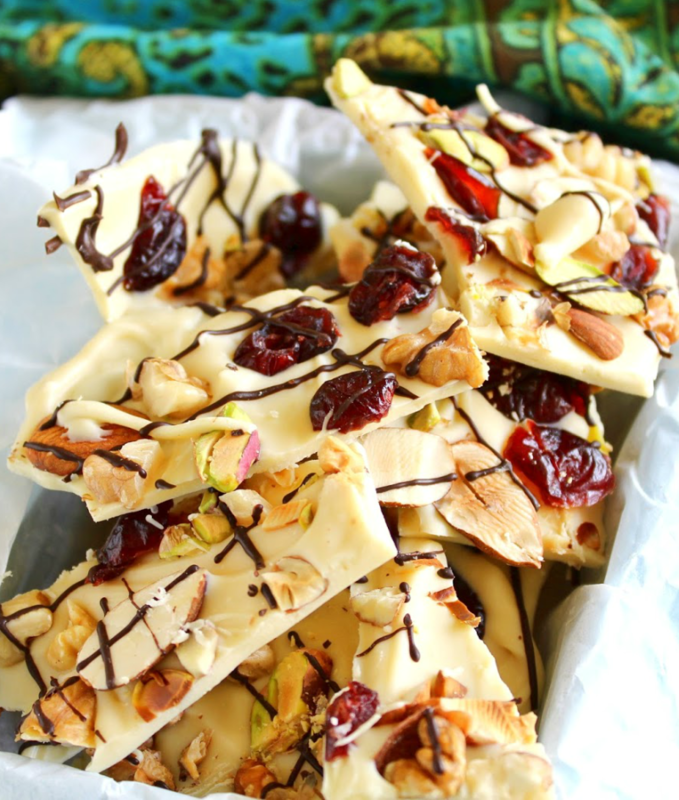 Now oddly enough, I had on hand small packets of pistachios, almonds and cranberries and more white chocolate, than dark or milk and in my head white chocolate pairs beautifully with both cranberries and pistachios. Thirty minutes were all I needed to whip up a batch, checkout the recipe below to find out how I made it. Start by dry roasting the almonds and pistachios for 30 secs on high power in the microwave or in a dry pan till they give out a nutty aroma. Once roasted roughly chop the nuts and cranberries and set aside. Melt the white chocolate over a double boiler (or in 30-second intervals in the microwave on 50% power, stirring after each). Once the chocolate is melted, remove from the heat and let sit for a few minutes to cool slightly, stirring occasionally. Add the pistachios, almonds and cranberries and stir to combine. Spread the chocolate mixture onto the prepared pan in an even layer (depending on the size of the pan and how thick you’d like your bark, you may not need the entire surface of the pan). You can make barks with your choice of chocolates, and toppings, just use whatever your like.